After a quiet Friday night with a low temperature in the 20s to lower 30s, snow and rain is now arriving at our South Coast. Any snow at the immediate shore changes quickly to rain, as the snow shield with advance to central New England by lunchtime, and then to the Canadian border by late in the day. Temperatures will be in the 30s to near 40° along the coast to near 30° well inland. There's not a lot of wind with the system, so the snow should fall gently to the ground, accumulating 1/4 to a 1/2 inch an hour over at 10 to 14 hour period. 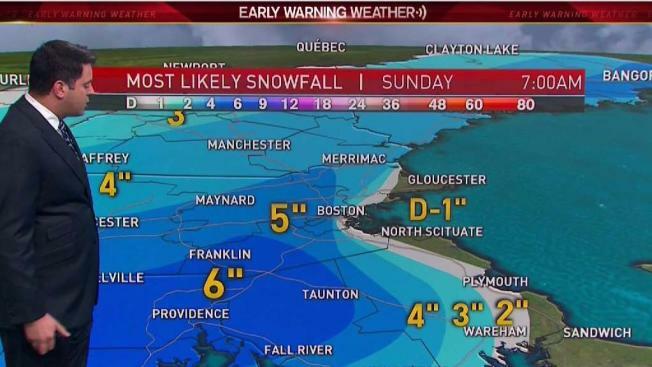 That gives us a general 4 to 6 inch snowfall. It's a different story at the beaches from south of Boston to Cape Cod, and over most of southeastern Massachusetts, where we get mostly rain, it may end is a little bit of snow, and in this region the wind will be from the northeast gusting 25 to 30 mph. Rain may end as snow at the coast, and any slush likely freezes with lows in the 20s tomorrow morning. Tomorrow may begin gray with some lingering snow in eastern Massachusetts and the state of Maine, but the breeze will pick up from the west so we will dry out with a mixture of clouds and sunshine and a high temperature in the 30s. It looks clear and cold tomorrow night, except for a few snow showers in the mountains. Low temperatures Monday morning in the teens and 20s, with a mixture of sun and clouds highs on Monday will be in the 30s. The next system will be closing in on us on Tuesday with a mixture of rain and snow once again. In southern New England the rain/snow line will be further inland than this time, but colder air will be working in and any rain will likely change to snow as the system advances in to the Gullf of Maine late Tuesday and Tuesday night. By Wednesday morning most of New England should have a fresh coating of snow, and perhaps double digit snowfall in the high country and ski areas. The coldest air since last winter arrives Wednesday night with windy conditions, low temperature on Thursday in the single numbers north and teens south. The second half of next week to also features cold air with a chance of a few more snow showers intol next weekend. The long range outlet is favorable for a white Christmas in most of New England.